People living on the Comoros archipelago in the Indian Ocean are needing to adapt to climate change. Farmers living on the Indian Ocean Comoros archipelago are being supported through a UN Development Programme (UNDP) initiative, to adapt to climate change in an effort to ensure they can continue to prosper in one of Africa’s poorest nations. Some 200,000 Comorians rely solely on agriculture to make a living from crops such as ylang-ylang, vanilla and clove; fragrant plants which have led many to name the small island nation, the perfume islands. But, changes to the climate are upending traditional agricultural practices and threatening the islanders’ livelihoods. 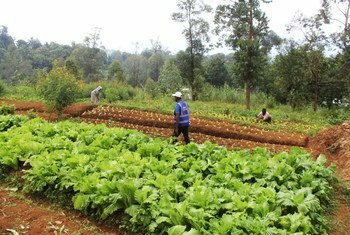 UNDP has partnered with the Government of Comoros to mentor farmers in a new agricultural approach. For more information on this story please click here.